Accompanied by local MLA Kartar Singh Tanwar and other senior officers of the environment and forest department, Hussain reached the site around 10 in the morning. 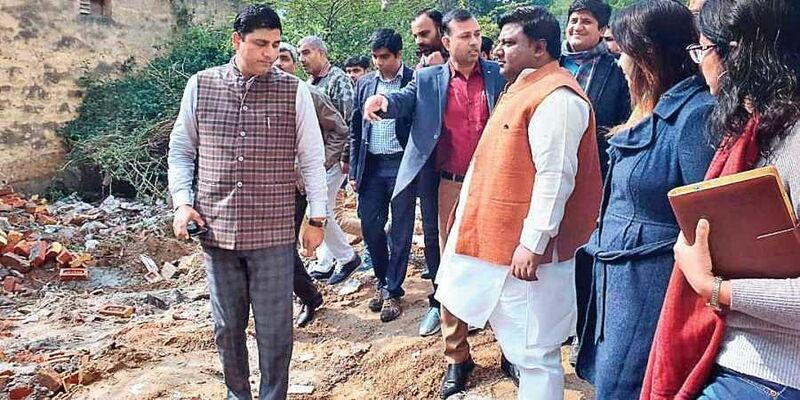 NEW DELHI: Delhi environment minister Imran Hussain oversaw an anti-encroachment drive in the Ridge area of Chhatarpur on Tuesday and ordered suspension of two forest officers allegedly responsible for large scale encroachments. According to a government statement, a large chunk of ridge and forest land was found under encroachment and illegal occupation. Some recently built structures on the ridge land were also noticed. “There were around five six spots where fresh encroachments were noticed. These seemed like wall structures which probably were built in the last two-three days. After consulting revenue officials, the structures were demolished,” a forest official said. Later, Chief Minister Arvind Kejriwal tweeted about his government’s commitment to eliminating ‘mafias’. “The government is working towards eliminating mafias from every sector. New Delhi has an honest government. The mafias were functioning in collusion with BJP and Congress governments,” he tweeted. After clearing the encroachments, the land will be immediately fenced. “While the government is making every effort to provide clean and fresh air to its citizens, certain vested interests are indulging in illegally occupying forest areas apparently in collusion with departmental officials. They are causing irreparable damage to the eco-system of Delhi,” Hussain said. The minister ordered suspension of two deputy forest rangers. He also directed the Principal Chief Conservator of Forest to seek explanation from the officers and to also initiate departmental action against the guilty. Hussain asked the forest department to put up display notice boards warning action against trespassers. As per geologists, the ridge is a northern extension of the ancient Aravalli Range, some 1500 million years old. Its importance cannot be gauged from the fact that it acts as the green lungs for the national capital and protects it from hot winds that blow from the deserts of Rajasthan. For administrative reasons, the ridge is divided into four separate zones — the Old Delhi or Northern Ridge, the New Delhi or Central Ridge, the Mehrauli or South-Central Ridge, and The Tughlaqabad or Southern Ridge.